The Binding of Isaac is an Action, RPG and Adventure game for PC published by Nicalis Inc in 2014. Help Isaac to escape from darkness. The story starts when Isaac’s mother hears a voice. This voice says that god wants her to sacrifice Isaac! He escapes to the basement immediately. At this basement, there are lots of scary creatures. The door is locked. He can’t do anything except fighting with them. In primary levels, You just need to escape from them. Because you don’t have ability to defeat them. If you were successful at escaping, Some coins will be given. So buy fighting items with these coins. Then face enemies. Fight to survive from this terrible condition. The basement is a small room with lots of holes! Enemies enter this room randomly from these holes. Earn skills and collect items to be more powerful. Otherwise, You will be hunted by the creatures of darkness. There are many puzzles in the game. Some of them are a bit complicated. It means that players need to spend much time to solve them. Isaac will have specified HP (Health Point). If these points get finished, He will die. The nightmares never end. So be careful about the large amount of enemies. There are more than 50 type of creatures that you have to defeat all of them. As I said, The movement of them will be in random ways. It would be hard to recognize their paths. 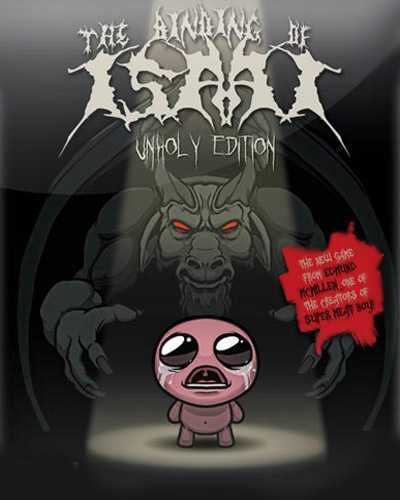 The Binding of Isaac has simple graphics made by pixels. But the gameplay is very addictive. Because of the gameplay, Players average rating in Steam is 10/10. Also critics gave this title 84/100 averagely. 119 Comments ON " The Binding of Isaac Free Download "
Whenever i try to run issac-ng.exe it says there is a problem with it, i used 7.zip to extract it. any suggestions? Could you do The Sims 4 please? I am very appreciate this. Thank you so much Ali! can you add mark of the ninja? How do you install the DLC? Could you plz add the ‘ReBirth” DLC to it. thx alot man you never fail to impress me! what is the password ?? anyone who managed to run setup ? i tried both versions but they won’t work can some one help? i tried to open it says im missing files? Try downloading it again, some files might’ve been corrupted while downloading. Happens sometimes. Type in https://www.freegamesdl.net, exactly as is. what if it doesnt work? the pasword? Ali, is this the latest update of the game? What is the file associating with the save file? I did a challenge and my round doesnt save for later when i get back on the game. I hit continue and I’m still doing the challenge. I know I can simply press new game but it gets annoying after a while. I would like to fully reset my game without redownloading it because this website is slow with download speeds. Please let me know how to fix the problem. is this the rebirth or the old one? i really need information..
Could you add cave story? thanks. The new link doesn’t work Ali! I have this error: the application was unable to start correctly 0xc00005 when I try to extract the “isaac-ng.exe”. the two old links still work wonderful, only the latest update one is error. Ali can you fix this cause I wanna try the new update of the game so badly! Thanks Ali! Hey Ali, were are the character.xml’s stored? Hey Ali, do you know where the character.xml files are? Could you please add the booster packs as they come out? I’d really like to see them. I Can’t Take The Password. Why does it take so long to download the new update? You can’t play Afterbirth + after the new update. It just stops responding. The download links aren’t working. It takes me to an ad, the ad closes, it takes me back here. Help? Hey ali, i have a suggestion, make a discord server for this site and add me on discord (Late#0940) and could you add images of the game to the site? How does one mod this?